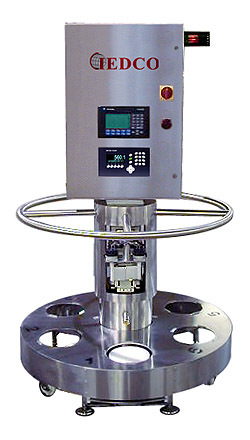 Designed to transfer tablets from a tablet press to small buckets, the IEDCO Tablet Carousel holds up to 6 buckets and will fill each to an accuracy of +/‐ 3 grams. 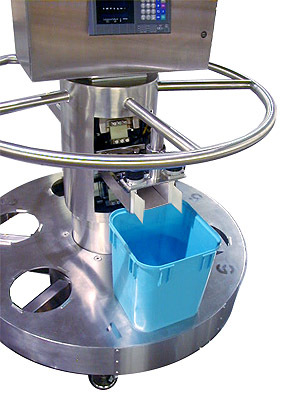 IEDCO’s Tablet Carousel cuts bucket‐handling time in half by automatically weighing each bucket accurately and eliminating the conventional 2‐step process of filling at one station and weighing at another. Its hands-free 6‐bucket system allows the operator to become more productive with other tasks rather than watching and waiting for each bucket to fill. The IEDCO Tablet Carousel is designed to eliminate inconsistencies in bucket weight while focusing on safety, containment, and ergonomics. Minimal Space Required ‐ the design of the carousel is such that it can easily fit into a confined space without hassle. What was once a tight squeeze for an operator has become a simple task. Man‐Power Savings ‐ rather than having an operator (or two) standing around waiting for containers to be filled, this system allows operators to occupy themselves with other tasks while the containers are automatically filled to accurate weights. An operator is only required to replace empty buckets for filled ones when the alarm is activated. Even the labeling has become easier as the preprinted labels are waiting at the system for the operator to apply them to their appropriate container.